What's that picture on my web site? 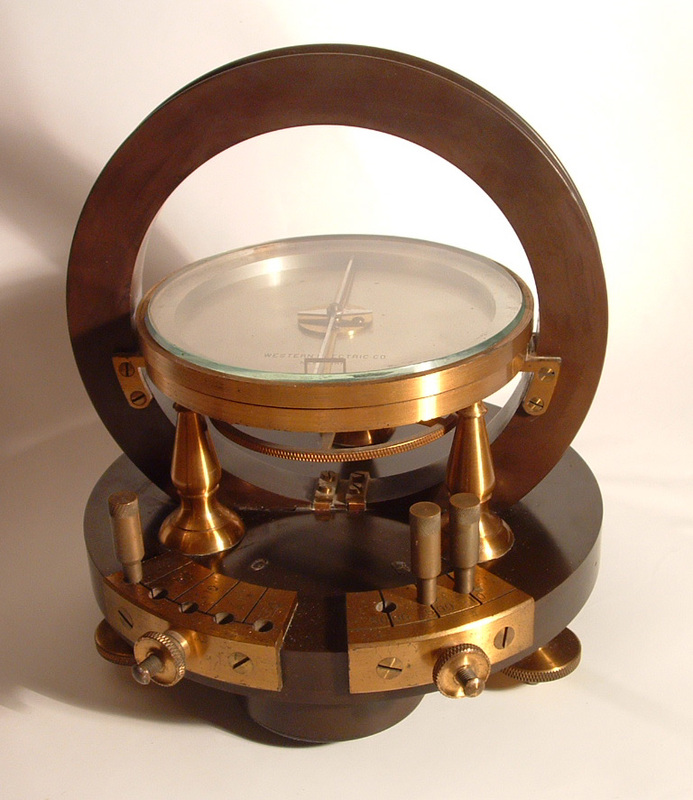 It's called a Tangent Galvanometer, a piece of telecom test equipment dating back to the telegraph era. As an electrical engineer, it seemed to make an attractive and interesting symbol for my web site. I have the original in my office. Essentially its an ohmmeter used to measure the resistance of telegraph lines. It consists of a galvanometer with a selectable number of turns and three standard resistors. The magnet in the needle is aligned with the earth's magnetic field. 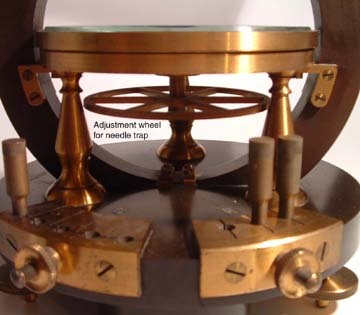 The rest of the instrument is rotated so the needle reads zero, which aligns the Helmholtz coil so its field is perpendicular to the earth's field. 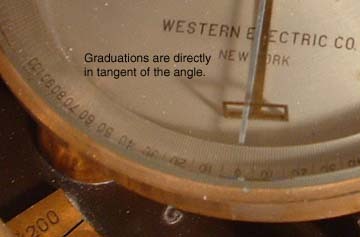 There is a little cage constraining the needle and adjusted by a wheel below so the needle cannot fly wildly during movement or transients. In a sense, this predates the use of return springs on meter movements. 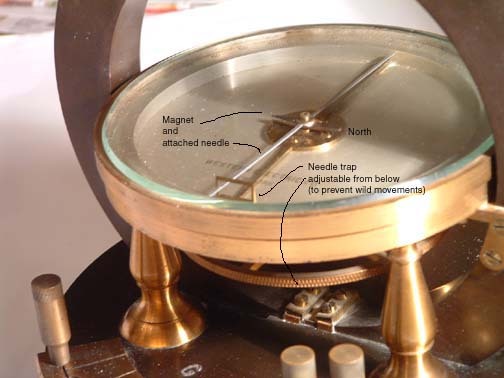 Any current through the galvanometer creates a field perpendicular the earth's field and the sum of the two fields rotates to the left or right causing the needle to deflect. The current is proportional to the tangent of the angle of deflection, so the meter is calibrated in tangents as well as degrees. The number of turns is selected with a connecting peg. Series resistors can be added by removing appropriate shorting pegs. 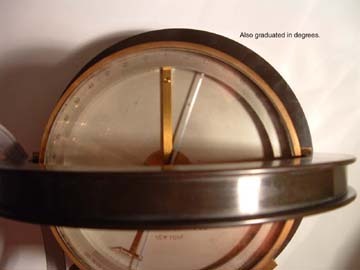 One side of a battery (wet cell) is connected to ground and the other connected to the galvanometer. 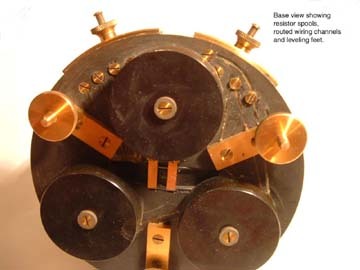 The other side of the galvanometer is connected to the telegraph line. The operator at the far end of the line is telegraphed instructions to open circuit the line and a turns ratio is chosen to give a good reading. The tangent of the angle of deflection is read and recorded. Similarly the remote operator is instructed to ground the far end of the line and another reading is taken. 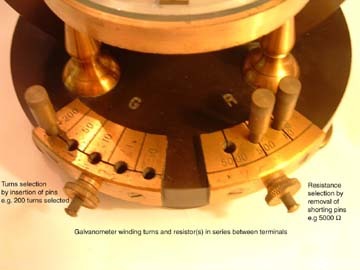 The galvanometer is then connected across the battery with one or more of the resistors in series with the meter (by removing shorting plugs), and the tangent is recorded. A simple ratio of the known resistor, turns ratio and tangent reading to the turns ratio, tangent reading and unknown resistance of the telegraph line allows the unknown insulation resistance and resistivity of the telegraph line to be calculated. The resistances were used to estimate how many miles away to look for breaks in the telegraph line. Readings were made daily, and as often as every couple hours if the weather was changing. As a matter of interest, an instruction text cited a typical insulation resistance (open circuit) of 16,000 ohms and a grounded (short circuit) resistance of 8,000 ohms. Circuit characteristics are considerably improved today. Where did this meter come from? I found it on the shelf at an electrical wholesaler in Holyoke MA in 1972, who was going out of business. I didn't know what it was and neither did the owner, but he asked ten dollars for it and I bought it. For years I had no idea what it was. Attempts to find out from Western Electric (who's name is on the instrument) were fruitless. Eventually I was at a US Centennial Exhibition exhibit at the Smithsonian in DC in 1976. It was an exhibit of technology from a centennial exhibition in 1876. In the display case was a meter identical to this one. I ran down the curator of the exhibit who in turn put me in touch with Bernard Finn, the curator of electricity for the Smithsonian. He provided me with copies of pages out of some old instruction books explaining what it was and how it was used. This provides an approximate age for the meter of about 125 years.